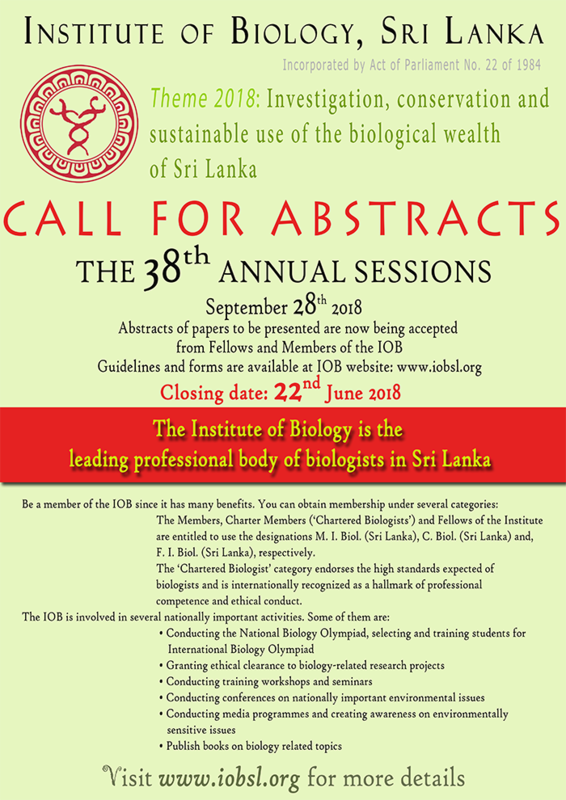 The Institute of Biology (IOBSL) invites its members to submit abstracts based on their original research, to be considered for presentation at the above sessions. The abstracts will be peer-reviewed before acceptance for presentation. The accepted abstracts will be published in the proceedings booklet. An award and certificates will be awarded for the best abstract presentations selected at the annual sessions. The deadline for submission of abstracts and related documents; 4.00 pm on 22nd June 2018 will be strictly adhered to. i) The abstract must report original research. ii) The title should be brief and explain the study reported. Capital letters should be used only for the first letter in the first word of the title and proper nouns. The address of the Institution in which the work was carried out should be included. If the collaborators are from different Institutions, the addresses of the respective institutions should be included. The name of the presenting author should be underlined. Capital letters should be used only for the initials and the first letters of the surnames of authors. The text of the abstract should not exceed 300 words. iii) Standard abbreviations of SI units should be used. iv) Acknowledgements should be restricted to funding agencies. v) The abstract must be submitted in MS word format. i) The extended abstract should not exceed 800 words. ii) The text should cover the following aspects: Background, Objectives, Research Design, Materials and Methods, Results and Findings, Conclusions. iv) Tables and diagrams should be included only if essential. v) References must be given at the end of the extended abstract. i) Annexed Form A must be completed by the Principal/Supervising Author and the signed and scanned soft copy of form A should be sent with each abstract submitted. All correspondence will be addressed to the Principal/Supervising Author. In the event that the presenter indicated in the application is unable to present the paper at the sessions it is the responsibility of the Principal/Supervising author either to withdraw the paper in advance or arrange for one of the Co-authors to present the paper. In the case of a single author where he/she could not present the paper due to ill health or any other valid reason the council can decide to grant a grace chance to present the paper at the next IOB Annual Sessions. ii) Annexed Form B should be completed by all Co-authors. In case of student members, the Head of the Department concerned should certify this form. A scanned copy of filled and signed Form B of each co-author should be submitted with the abstract.